At a glance, Beat Saber looks like a horribly cynical conglomeration of ideas borrowed from other games. It combines the rhythm-action of Dance Dance Revolution with the simple slicey-dicey fun of Fruit Ninja, then throws in some Definitely Not Star Wars lightsabers to definitely not pander to that particular fanbase, and assembles this box-ticking assortment together inside a VR helmet. I almost feel obliged to dislike it. It seems like something I should be fundamentally against, based upon a watery set of principles that I haven't bothered to define but know I definitely stand for. 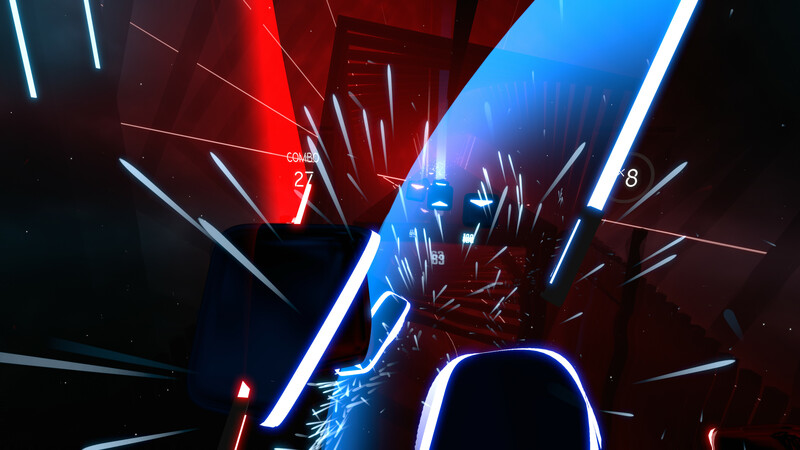 Unfortunately, standing between me and this unspecific moral high ground is one small problem: Beat Saber is really, really good. The format is a standard rhythm-action fare, in which you must strike coloured blocks as they approach you in time with the beats of a piece of music. In your right hand you clutch a blue not-lightsaber, and in your left hand you hold a red not-lightsaber. As the music plays, a flurry of red and blue blocks will float rapidly toward you, and you need to slice each block with the matching-coloured not-lightsaber. Each block also has an arrow on it, which indicates the direction the block needs to be cut in. The effect, essentially, is the play of Dance Dance Revolution, but reapplied to your hands rather than your feet, as you swing left and right, up and down in time with whatever song you're playing along to. 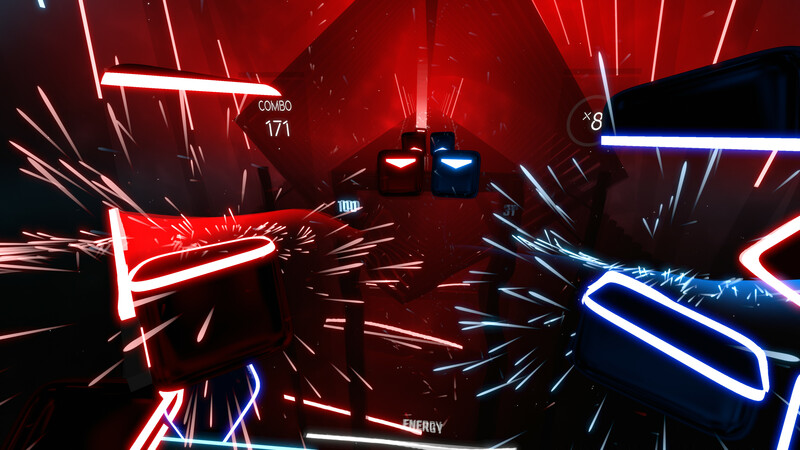 But there's also far more nuance to how Beat Saber can arrange its blocks. They can come at you from several different “lanes”, much like in Guitar Hero, but the stereoscopic 3D effect of VR means they can also approach from different heights. Some arrangements force you to swing left and right or up or down at the same time, or awkwardly cross your arms to hit blocks with the appropriately coloured not-lightsaber. Occasionally you'll also have to dodge large red walls by leaning left and right, or ducking down, as if you're attending some weird cyber-aerobics class. Beat Saber is really easy to pick up and play – far easier than either Guitar Hero or Rock Band – as there are no buttons or weird fake instruments to learn. Swinging your sabers using either the Vive or Oculus Touch controllers is entirely intuitive. Indeed, you'll probably find that you can make your way through most of the game's (currently limited) selection of tracks on Normal difficulty with few problems. Yet while learning Beat Saber is straightforward enough, mastery offers a far sterner challenge. 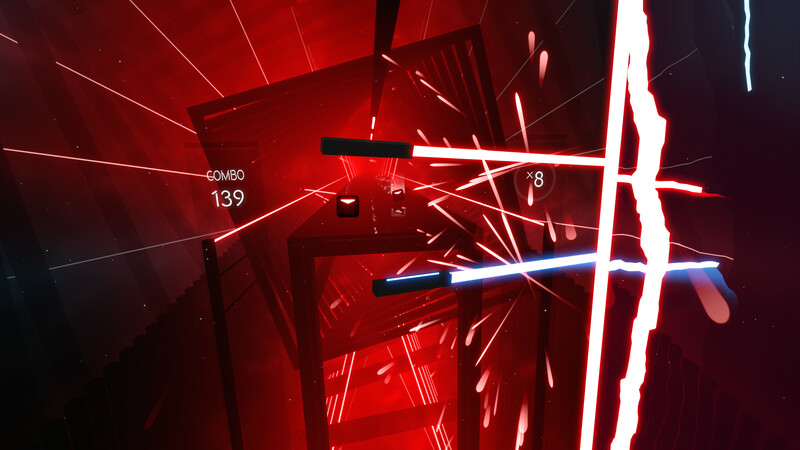 Beat Saber's scoring system doesn't just track whether you successfully cut the right coloured block in the right direction, it also awards additional points for both the precision of that cut and how hard you cut it. I'm not entirely sure how the precision aspect works; I think it awards you more points the more central your cut is through each block. But certainly, putting your arm into each swing demonstrably affects the amount of points you receive for cutting. You also build up multipliers for each successful cut, so making a mistake can seriously damage your final score. 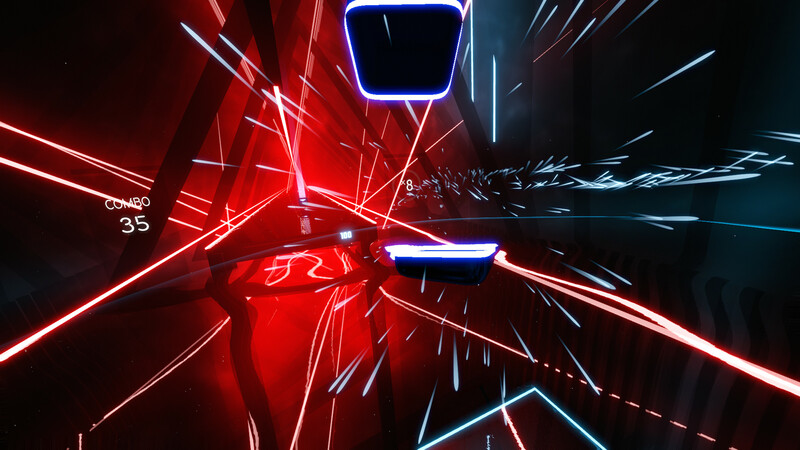 Hence, to be good at Beat Saber, you need to blend precision, strength, and consistency in your swings. And that's just on Normal difficulty. There are two additional higher difficulties – Hard and Expert, each providing a substantial jump in challenge. Hard difficulty significantly increases the number of blocks you need to cut per second, while also introducing new blocks that have to be cut diagonally. As for Expert difficulty, well, I wouldn't recommend it for anyone who has a heart condition...it's a bit nuts. 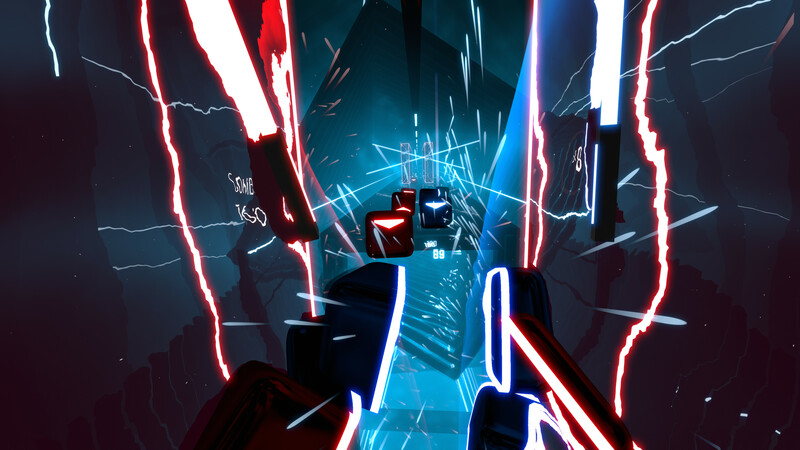 Despite having only just launched into Early Access, Beat Saber already feels like a complete game, at least at a core level. The only real problem with it right now is the meagre track listing, which amounts to roughly a dozen songs, most of which are various flavours of moderate to fast-paced electronica. Crucially, though, each of those tracks is really well synced to the arrangement of the blocks, and that goes for all difficulties. I think that's preferable to having fifty tracks which don't sync up as well. Certainly, though, Beat Saber will have to substantially increase both the number and variety of tracks available prior to launch. Apparently one planned feature is a level editor that will let players create their own levels to whatever track they wish. Hopefully they'll be able to share those levels with other players, which would significantly add to Beat Saber's lifespan. Even as it stands, however, Beat Saber is a great reason to dust off your VR headset, push the furniture to one side, and have a neon dance off with your friends.